AU $1,091,000	Base price Need Finance? AU $1,091,000	Base price Need Finance? Need Insurance? CARIBBEAN 49. Power, strength and integrity describe all aspects of the New C49. The blue water hull design, proven engineering, allocation of space and timeless styling are among the reasons why people cant speak highly enough of the Caribbean 49. Coming from International Marine in Melbourne. 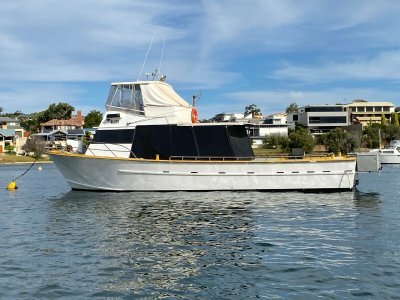 Australia's longest running boat building company you would be buying into a legend. With the backing of Mansfield Marine WA's CARIBBEAN DEALER for 24-49ft models you can be assured that we will take care of everything. 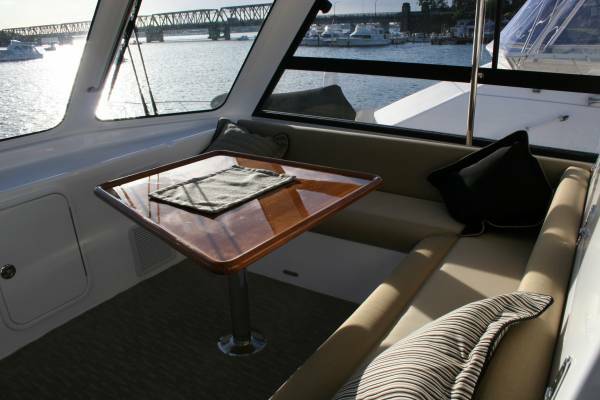 We provide a level of service not previously offered to Caribbean customers in WA. 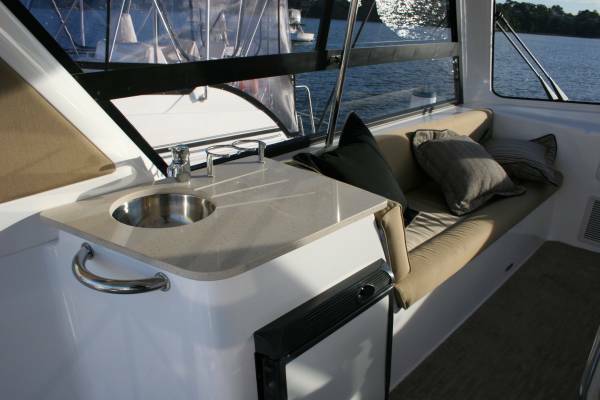 We can personally customize your boat in house with every option imaginable. 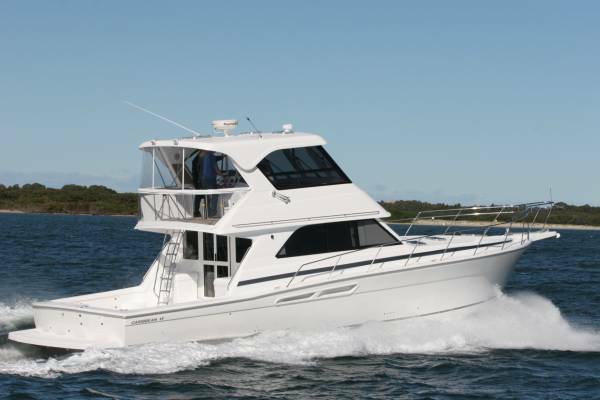 With 8 x New Caribbean 49's now sold into WA, it is evident that customers see that this boat is the best boat for WA. Dominant performance, value for $$, second to none resale, are all reasons why they chose a Caribbean over the others. Having built some "50,000 boats in 50 years" Caribbean have incorporated a significant number of upgrades into this NEW MODEL 49. Her new profile lines to the bridge structure, and the LARGEST COCKPIT IN ITS CLASS boasting 165sq/ft of space are significant differences to the now deleted C47 model. 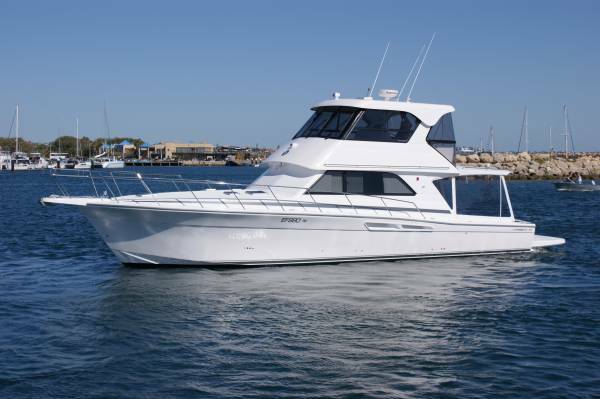 Huge amounts of under deck storage, class leading refrigeration as standard and a re-modeled interior propel this sea going legend into a new league. OPTIONAL HYDRAULIC SWIM PLATFORM to make things easier. Stylish new lines will make her a sleek and imposing craft on the water. Whether your pleasure is weeks or weekends away, offshore gamefishing of a combination of both, this boat is designed to cover all your needs. 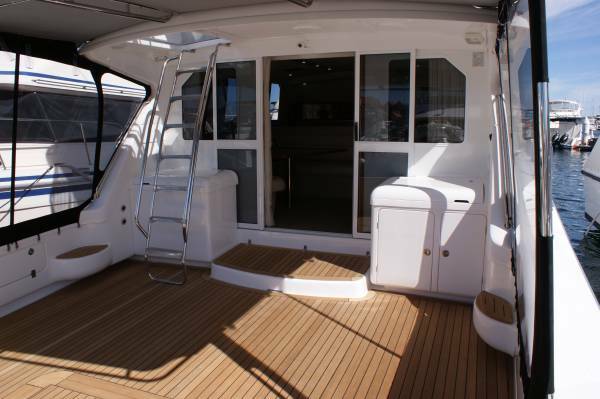 Her luxurious amenities are the key to maximising your boating experience. These include three cabins, two bathrooms, a gourmet galley with side-by-side fridge and freezer, dishwasher, convection microwave and a ceramic cook top. The Saloon features soft leather lounge and dinette, complemented by the latest contemporary furnishings and an abundance of hand crafted polished timbers throughout. The C 49 has something for everyone, with two entertainment centres, boasting two Tv's with integrated DVD systems and three zone stereo/CD audio, air conditioning, four fridges, a bar unit with icemaker and spaciousness well beyond the measure of most 49 footers. Performance will be unsurpassed by any previous model. 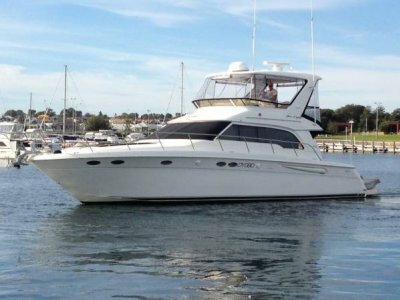 She is a genuine offshore cruiser featuring an enclosed flybridge with a comprehensive command station, luxurious helm and companion chairs as well as a lounge, dinette, fridge and sink unit. Standard power is CUMMINS 715 HP engiens that will push this 22000kg beast to more than 31 knots. 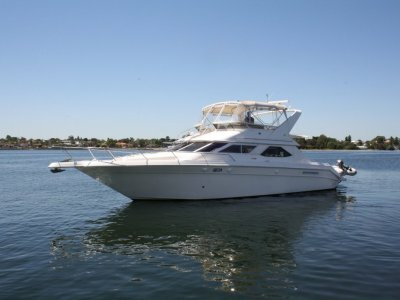 For a big 49ft boat of this calibre, it is exceptional value for money compared to other boats available. 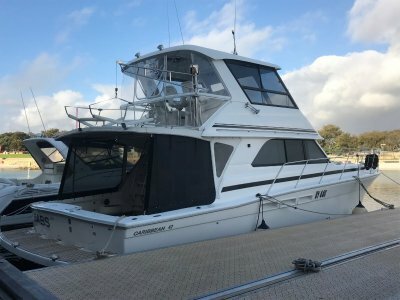 If you want any options fitted to make your boat unique so it reflects your personal taste, then Mansfield Marine can enhance your new boat with any option imaginable. 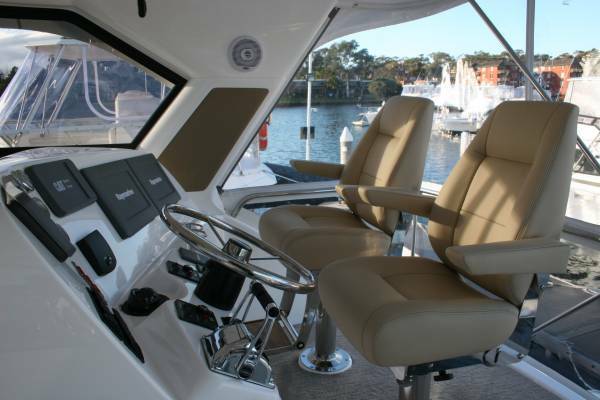 We at Mansfield Marine can supply and deliver your NEW CARIBBEAN to anywhere in Western Australia. We can also offer service and back-up, no mater where you are. 2 x Cat C12 715hp engines with TD 5114A Twin Disc quick shift gearboxes and single lever electronic controls. Engine room: Incredible space and access to all component for ease of servicing and maintenance. 3 x cabins, ( 2 x doubles, 1 x twin bunk) 1 x double and a single convertible in the saloon. 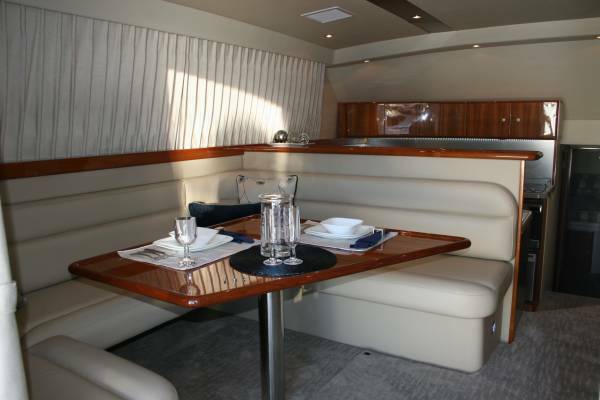 Optional convertible in the enclosed flybridge. Gourmet size, including side by side fridge and freezer, Dishwasher, Convection Microwave, Ceramic Hotplates and corian style tops. 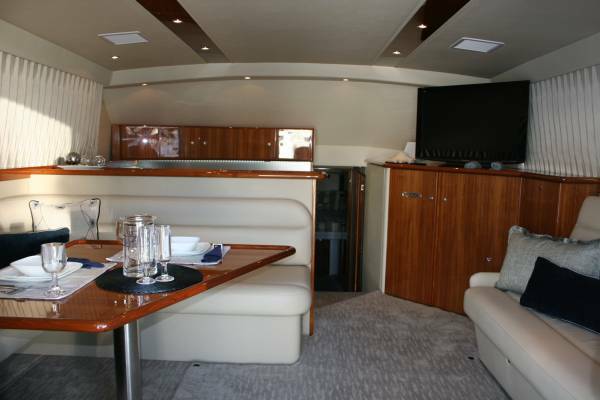 Galley, plus Cockpit U-Tech / ice chest, bar fridge and Flybridge fridge. 2 x vacuflush toilets with holding tank. 20 lifejackets, Offshore flare kit, 406 Epirb, VHF and 27MHZ radios, 4 x Fire Extinguishers, a First Aid Kit, 8 x Mooring lines and 2 x Large Fenders. 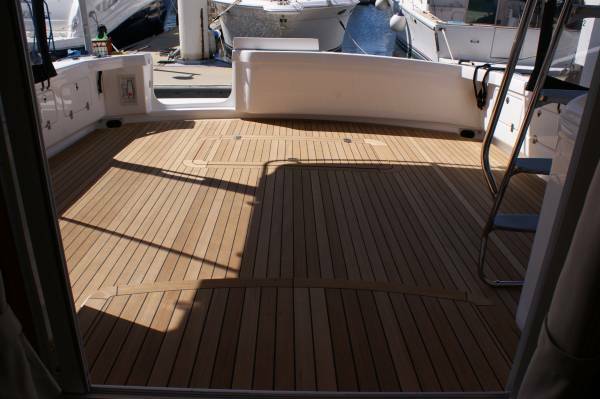 Optional, Mansfield Marine can specify a package or we can supply and install a system to your specification. 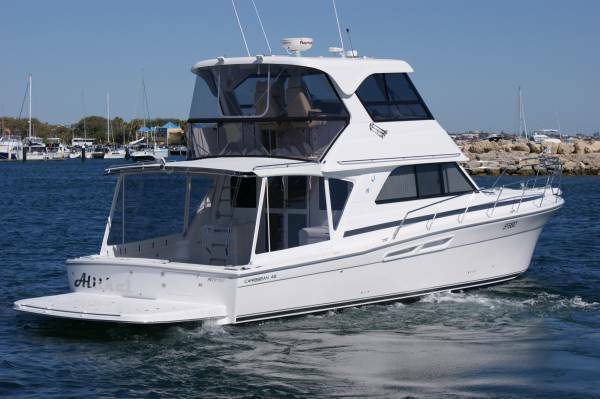 With 3 x New Caribbean 49's now sold by us to WA customers in the past year, it is evident that it is the perfect WA boat.